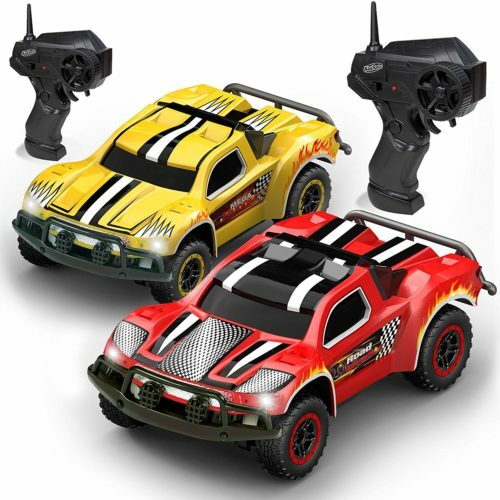 ids love the thrill and speed of driving remote control cars, and there are some amazing choices on the market out there. Some of these are quite big, and for those looking for something a little bit smaller, there are some amazing mini and micro RC cars to choose from. Despite their small size, these little racers can really burn some rubber, and they make great gifts that children will come back to again and again. Also, if your child wants to get a gas powered car at some point, getting them started with a mini will be a great choice, as they are quieter, more reliable, and need less maintenance. However, there are a lot of different factors to think about when buying one, we want to make sure that you get the right gift for your little race driver. There are loads of different types of mini toy RC cars, and we have selected some of the best on the market to compare so you can find the ideal gift for the little boy or girl. Toys vs Enthusiast models: As with most other radio controlled products, they broadly fall into two categories; toys and enthusiast models. ‘Toy’ is pretty self explanatory; it’s made for kids and easier to use. Enthusiast models are much more complicated bits of machinery, and they require a lot of care and maintenance. They are much faster, more expensive, and are really made for adult hobbyists and collectors. Unless you are buying for an older child who is serious about cars or an adult, you are best to steer clear of enthusiast models and stick to the toys. Durability: Just as formula 1 drivers don’t want to see their beloved motors clapped out in the pit stops, your child doesn’t stare at their broken-down new racer, wishing that it was still working. And we’re sure that you, there parent, don’t want to have to listen to them begging you for a new one every minute of the day. So you’ll want to make sure and buy a mini RC that is durable and robust. Your kids are going to get up to all kinds of crazy antics with these things. There’ll be races, stunts, jumps, and the odd crash now and again. Keep their racing dreams alive and make sure you get them something that can withstand the usual wear and tear these things get. Battery Life: Unlike a lot of bigger cars that may be powered by nitrogen or gas, mini RC toy cars have electronic motors which run off rechargeable batteries. While these electronic motors do have a lot of pros, they also have the con of needing to be recharged. Your kid is going to get the best use out of the car the more time it can screeching down the road and the less time its sitting in the cupboard while the batteries are charging. A big consideration, then, is going to be the amount of battery life you get out of the car and how long it takes the batteries to charge. Batteries Included: If the car come with batteries included, the first main benefit is going to be that your child can get stuck into their new speed machine as soon as it arrives. Secondly, you don’t have to worry about buying the right type of rechargeable batteries. It’s also worth looking into whether or not the car comes with a separate charger or it has an in-built charger. If it doesn’t come with batteries, you should order them when you buy the car. WaterProof: The importance of the car being waterproof might change a lot depending on where you live and whether your child will be using it inside or outside. That said, a waterproof car is going to have so many benefits, we think that it is worth going that extra mile to get one. Your child will be able to take it wherever they want, and can go driving with it outside without worrying about the weather. Scale: Most micro RCs are usually measured in scale rather than showing their dimensions. For someone not familiar with the scale, it can be really hard to get a good idea of the size, as numbers like 1/62 and 1/32 seem quite abstract. A 1/32 scale car will take up most of the palm of your hand while and a 1/62 scale car is barely bigger than your little finger, and it could be very easy to get confused. In order to correct size, we recommend talking it over with you child first to get an idea of how big they want it, and then try to find a product that has a picture which gives you and idea of how big it is. That way you can get a good idea of the scale of car your child wants. Ready-to-Use: Before you click on that ‘buy’ button, make sure you have investigated how easy the car is to get going. Most parents are looking for something that will be pretty much ready to go straight out the box, perhaps after a quick battery charge. Other micro RCs might need some assembly before they are ready to go, so its good to chat with your child in order to see what is best for them. Maybe they are an aspiring mechanic who wants to put the car together before taking out? Or maybe they are a junior Michael Schumacher who just wants to tear up the road? Regardless, be sure you know exactly what you are ordering. This pretty little micro car will be a great gift for your little princess. Minnie Mouse of one of the most recognized cartoon characters ever created, and this stylish little machine is sure to go down well with Disney fans. The car is great for young drivers with its easy-to-use controls, and its unique spin feature is great when a little chaos is required. We have heard that it doesn’t work well on carpets, so think about that before purchasing. A lightning fast cartoon car that is great for future racing champions out there. This colorful little package is a great deal for your child. The car can reverse and go forward, and it has a sounding horn and LED headlights which can be turned on and off, so they’ll have lots to play with. The driver figure is also detachable, so they have an extra action figure to add to their collection. What we really love about this is the manufacturer’s guarantee that it is made of environmentally friendly and non-toxic substances, so you can rest easy knowing that this is good for both your family and the environment as a whole. This super cute mini RC car will make a great toy for any young child. Its simple controls, with one button for forward and reverse and another to turn, means that its a great and simple car for children to get the hang of. Not only will your child love the cute design of this car, its has been specially made with durable ABS plastic yet it only has smooth edges, so you don’t need to worry about safety. 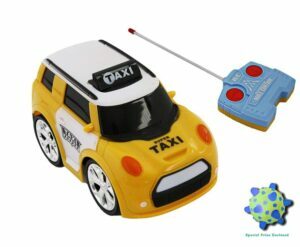 This would be amazing first micro remote control car for your little one. This dazzling micro rc car will be a great choice for any kids who like a bit of sparkle and glamour. Kids will love its flashing lights and cheerful music. Not only is this a stylish and colorful option, it’s huge wheels can get over all kinds of obstacles. This is also very light and easy to carry, so your kids can take it with them on their adventures. 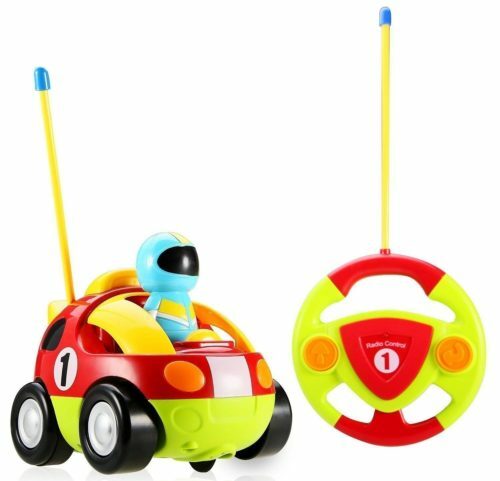 Best of all, this things has full 360 degree rotation, so you’re little race driver will have a lot of fun pulling off all kinds of skids and spins with this colorful car. This super cool mini is a nice present for any dare devils out there as it comes with different stunt accessories for some really wild play. The manufacturers have also built the controller with three different frequency settings, so you can buy and use up to three without them interfering with each other. This micro RC is one of our best picks simply due to it its convenience. You’ll get 15 minutes of play time with only 5 minutes in the charger. Even if you have to stop and charge it every so often after a quick timeout or bathroom break it’ll be ready to go all over again. What is also wonderful is that this car has a built in rechargeable battery, so you’ll only need batteries for the controller. Older kids are going to be looking for something a little more powerful, and the Mini Racing Coupe is definitely that. Serious, these things are so much fun that the biggest problem kids have is wrestling them away from their parents! The specs of this mini RC cars wonder sounds something you’d find in a real car. Shock absorbing suspension, rubber tires, working headlights, 4 wheel drive… your child might be getting an RC model on par with the family car. This really is a wonderful high-quality toy that your children will fall in love with. At the time of writing, this is sitting on 5 star rating on Amazon, so you’d better check it out before they are all sold. Best of all, it comes in single or two packs, so siblings can bond over racing each other. These little cars are such a cool package! 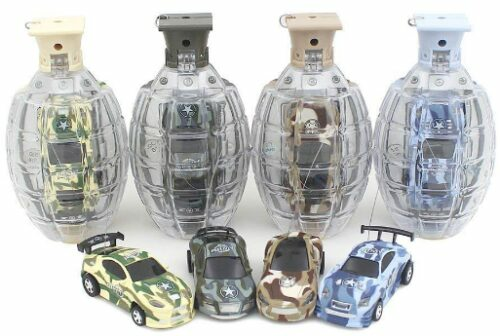 They come in neat little grenade holders, making them a good gift for any little soldiers or car fans out there. The first big pro with these cars is the size. These are small and light, so your child can take them anywhere. Secondly, they are very sturdy and the front wheels have shock absorbers, so it is a durable little toy. We also really appreciate the different frequency settings, so you can use more than one without interfering with each other. This is a brilliant little mini RC. This yellow micro RC car will really capture your children’s imagination as it comes in a cool drinks can package! But its not all about the pretty casing for this mini racer. This is a very fast car despite its tiny size, so your kids will get a huge thrill speeding all over the place in it. Plus, its got a smart chassis to ensure that it is stable and sturdy despite its fast speed. As you’ve seen from above, there’s a lot to take in when it comes to choosing the right mini remote control car for your child. Taking into all of the different factors we looked at, we recommend picking up the Racing Coupe. These cars are little beasts that will give endless amounts of enjoyment to your little racers. They are super fast and reliable, and the quality of the build is just outrageous. With power steering, 4 wheel drive and shock absorbing technology, this sounds better than the cars some of us at buzzparent drive to work every day! Better still, it has a lot of good customer reviews, demonstrating its quality and value. The only drawback to this monster is that its only really suitable for 6 years and up. If your kids are younger, look at the FPVRC Car or the Hakjoys First RC Cartoon Racer. Are you in the market for a great ‘bang for your buck’ deal on a small rc car? Well you really can’t go wrong with the Coke Can RC Racing Car. Kids will love their cool carrying cases, and the fact that they are small and light means that they can go anywhere with your little race drivers. That said, their small size doesn’t mean that they skimp on speed or sturdy construction; these cars are durable and fast. So if you are looking for a mini remote control car on a budget, look no further.